This research focuses on first-year, first-semester, prospective biology majors. Historically, these students encounter a challenge adjusting to college-level expectations (Figs. 1-3). While we have recently revamped our introductory course sequence (2008), students have continued to struggle. Recent years have shown that fewer students drop the course and instead persist and either fail or receive a D. After learning about metacognitive strategies at the November 2008 ACM Teagle Conference, I was interested in the following two questions: Will an introduction to metacognitive skills help students adjust to college-level biology course expectations, and therefore perform better? Will there be a difference in student performance when exam wrappers are explicitly included? Figure 1. 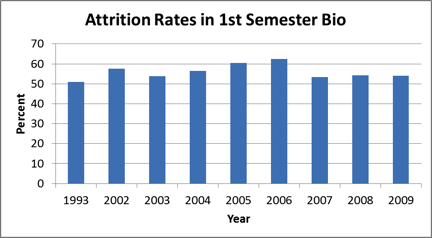 Historic attrition rates, defined as dropping or receiving a grade lower than C-, for the first semester biology course at Monmouth College. Figure 2. 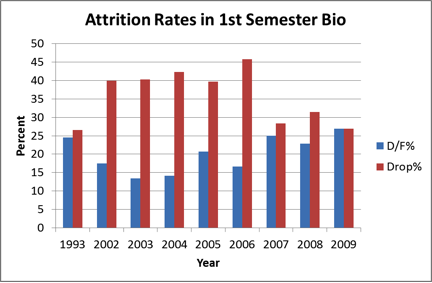 Historic attrition rates broken down into drops vs. grades of D or F for the first semester biology course at Monmouth College. Figure 3. 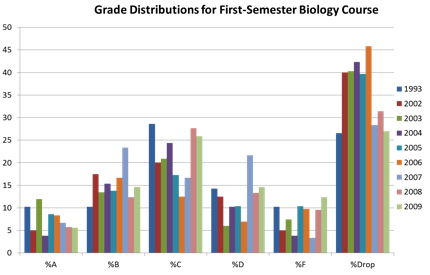 Historic grade distributions for the first semester biology course at Monmouth College. This study was implemented in BIOL 150: Investigating to Biological Concepts. This is our first-year, first-semester biology course for biology majors. There is a separate biology course for non-majors that satisfies their general education requirement. The course is divided into two lecture sections of approximately 45 students each. It is further subdivided into three lab sections of approximately 30 students each. The course meets for three 50 minute lecture periods and one 3 hour laboratory period each week. The course is offered in the fall and runs for the full 15 week semester. Course goals include introducing students to the scientific method and major biological concepts at considerable depth including protein structure, cells, organelles, and cell membranes, aerobic respiration, photosynthesis, Mendelian genetics, DNA structure and replication, and protein synthesis. Laboratory sessions are centered around hands-on inquiries designed to reinforce topics from the lecture periods. Some further context is necessary here as well. BIOL 150 (and the next sequential intro course, BIOL 155 Introduction to Evolution, Ecology and Diversity) was designed as a consequence of a departmental self-evaluation. This was in response to the recognition of continued high attrition in the previous intro sequence (zoology in fall, botany in spring). However, after the first iteration of BIOL 150 it was clear that it wasn't so much the material, or how it was packaged, but more that there were some serious transition issues with our students. I wanted to see what improvements in student learning could be gained by including explicit metacognitive elements in the course. The second iteration (2009) of BIOL 150 included explicit discussion of metacognition, incorporation of Reading Reflections, use of Knowledge Surveys, and Exam wrappers. Reading Reflections replaced a "Biology in the News" writing assignment that was used in 2008. The Reading Reflection assignment was modified from Wirth and Aziz (2009) and was collected, graded, and responded to on Moodle. Reflections on the "what was confusing" prompt served as springboards for classroom discussions. A Knowledge Survey (304 questions) was designed for the entire course and administered through Moodle. Shorter parts of the Knowledge Survey were used prior to exams over the corresponding topics. After the first exam, students read "Learning to Learn" (Perkins and Wirth) and we discussed it in class. One section was assigned to turn in Exam Wrappers after the first two exams. Timing of the metacognition "intervention" remains an issue. After discussion with fellow ACM Teagle Metacognition Collegium faculty, I decided to do it early in the semester, but not right at the onset. Students have been receptive to discussing it after the first exam (bloodbath...), but that means that some have already dug deep holes. To alleviate this issue, in 2009 I allowed students to drop their lowest exam score (one of four lecture exams). In 2010 I have made the first exam only 50 points instead of 100 (1000 total in the course). Another permanent modification for 2010 is the institution of Exam Wrappers for both lecture sections. While they alone may not be responsible for the differences in the two sections from 2009, they clearly have metacognitive value. Metacognition has given me a new language to use when talking to students about their learning. Reading Reflections give me a tool to hear where students are struggling and respond. Knowledge Surveys help students see what topics are important and what types of questions they should anticipate on exams. There are clear improvements in learning outcomes for the students who did Exam Wrappers in 2009 vs. those who did not (see fig.). It would be premature to attribute all of the improvements to Exam Wrappers or metacognition in general,though I am convinced of their value. Many other elements of the course also changed from 2008 to 2009: for example Supplemental Instruction was provided. My evidence stems from individual student responses to common questions on their final exams across two years. See figure below. I now include discussion of "Learning to Learn" in all of my classes. I use it largely to help students understand their own cognitive processes, but also to define our roles in the classroom. We rapidly abandon strict lecture format and adopt a loose discussion mode. This is tough in a lecture section of 45, but I break it up into groups at least once in each period and make the students responsible for answering questions and explaining information to one another at chalkboards. Further modifications I would like to incorporate include adapting the Exam Wrapper assignment to a Moodle format. I intend to retain the Reading Reflection assignments and the Knowledge Surveys as well. Wirth, K. and F. Aziz. 2009. Reading Reflections: A Simple Activity for Promoting Metacognitive Development and Learning? Poster Presentation at the Innovations in the Scholarship of Teaching and Learning at Liberal Arts Colleges, Wabash College, March 6-8, 2009. Wirth, K. and D. Perkins. 2010. Learning to Learn, version 28. Available from http://www.macalester.edu/geology/wirth/CourseMaterials.html. Accessed September 23, 2010.